There’s no Christmas without the perfect turkey centerpiece. 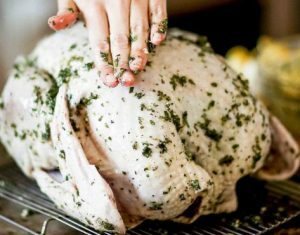 Roasting a turkey and make it perfect for that Christmas dinner with family and friends can be intimidating, that’s why we’ll show you easy techniques to perfectly roast a turkey. Get in the holydays spirit and keep it classy with the recipe below. 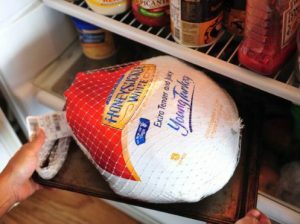 1 Remove the turkey from the fridge at least an hour before cooking and heat the oven to 220C/fan 200C/gas 7. Calculate the cooking time – allow 30 minutes at high heat, then 30 minutes per kilo after you have reduced the heat. So a 5kg turkey will take three hours in total. 2 For the brining, you can do a dry-brining –which is basically rubbing the salt and seasonings directly into the meat and skin, and let it rest in the fridge for a period of time before cooking. 3 Put the sliced onions into the roasting tin. Put the turkey on a rack and then put the rack into the roasting tin. Pour 2 cups of boiling water into the tin with the onions and cover the whole thing with a double layer of foil. Put the tray in the oven and cook for 30 minutes, then reduce the temperature to 200C/fan 180C/gas 6 for the remaining cooking time. 4 After 11⁄2 hours remove the foil and close the door. Don’t open it again until the cooking time is up. 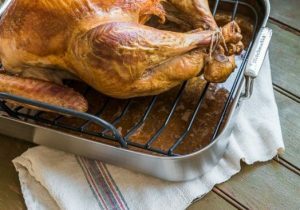 To test whether the turkey is cooked –use an instant meat thermometer. 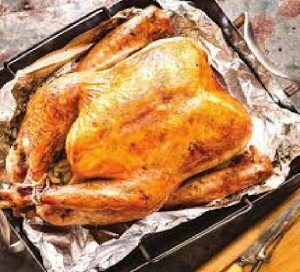 The turkey is done when the thigh meat reaches an internal temperature of 165 degrees F.
5 Take the bird from the oven, remove the onions, then strain the juice in the bottom of the tin into a large jug to settle. 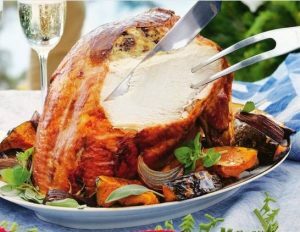 Leave the turkey to rest in a warm place covered with foil for 1 hour, then carve.